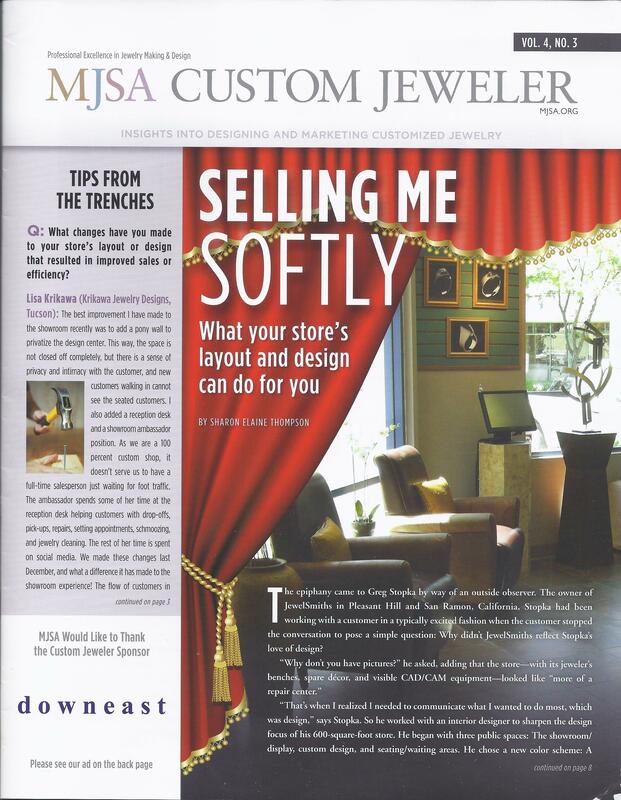 “Selling Me Softly.” Your store layout and design can get customers involved with your product, ensure they see everything you have to offer, and ease them into a purchasing decision. Click here for PDF. 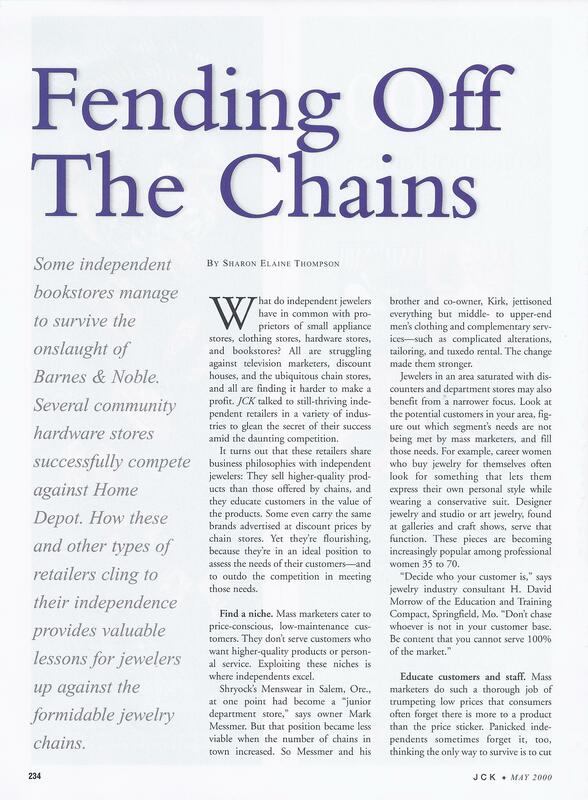 “Fending Off the Chains.” Small independents in all walks of retail face the same competition from big box stores, discounters, and chains. Here is how they compete. Click here for PDF. 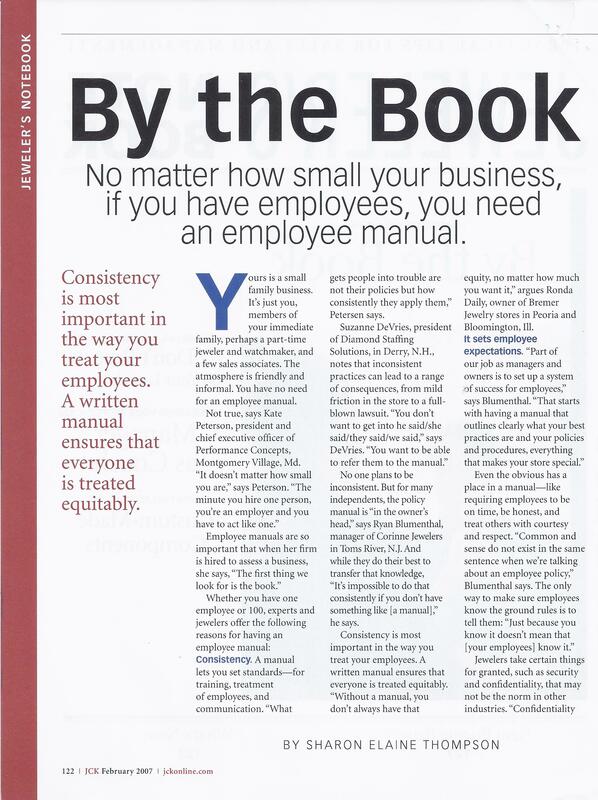 “By the Book.” No matter how small your business, even if you only have one employee, you need an employee manual. Here’s why and how. Click here for PDF. 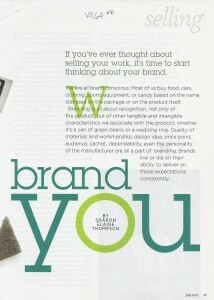 “Brand You.” If you’ve thought about selling your work, it’s time to start thinking about your brand. Click here for PDF. 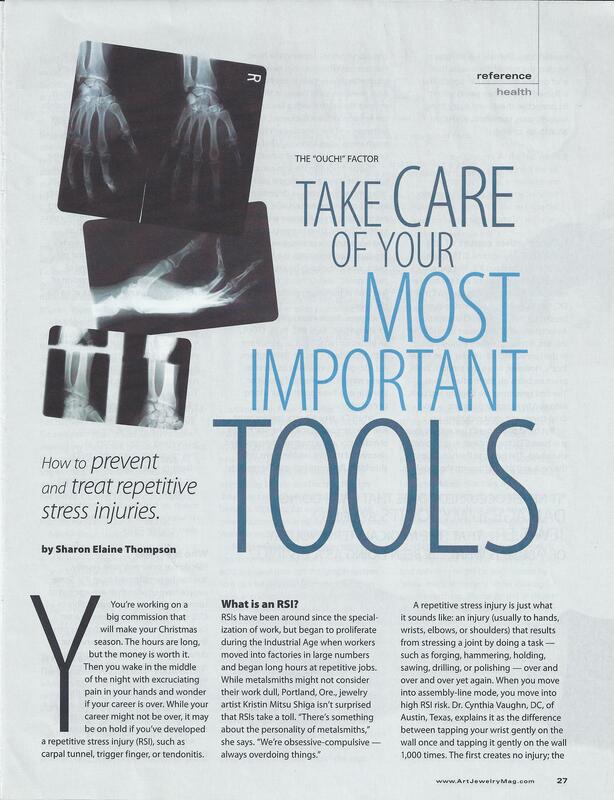 “Take Care of Your Most Important Tools.” You may not work in a factory, but if you don’t work correctly, you may end up with a repetitive stress injury. Here are some tips to prevent injury. Click here for PDF. “Can I Get It Wholesale?” Buying wholesale may be simply a matter of volume buying. 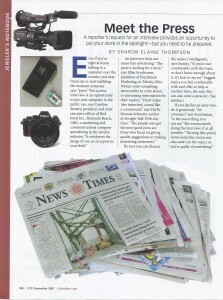 However, to gain access to certain shows and suppliers, you have to be able to prove you are more than a hobby business. 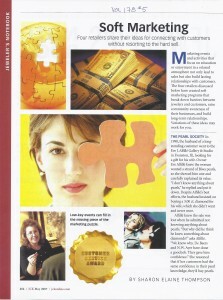 Some states, too, require licenses and tax certificates when you start selling. Click here for PDF. 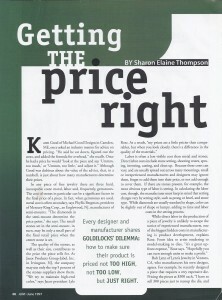 “Are You Cut Out for Custom?” Custom work can lead to satisfaction, challenge, growth, learning, the establishment of a reputation, and a steady income–all good reasons to take those commissions. Click here for PDF. 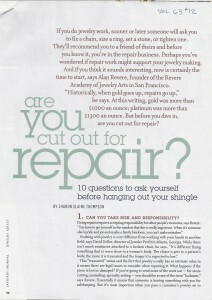 “Are You Cut Out for Repair?” 10 questions to ask yourself before hanging out your jewelry repair shingle. Click here for PDF. 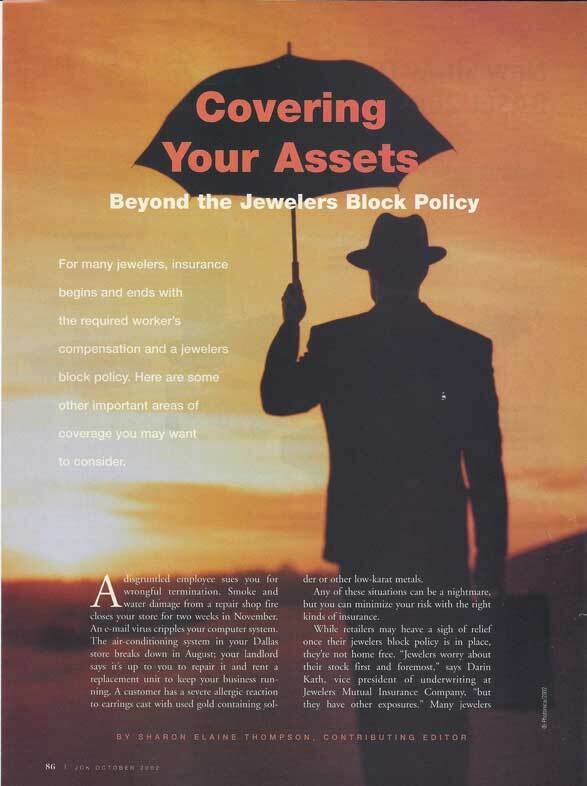 “Covering Your Assets: Beyond the Jewelers Block Policy.” For many jewelers, business insurance begins and ends with the required worker’s compensation and a jeweler’s block policy. But other threats—fire, vandalism, loss of business personal property, liability suits—can put you out of business without business insurance. Click here for PDF. “The Cyber Shop.” Bench jewelers and trade shops may not think they need a computer for much, even now. But using a computer in the shop can increase your profitability by enabling you to track your jobs, send invoices on time, design more flexibly, and connect you to a world of other jewelers buying and selling goods and services. Click here for PDF. 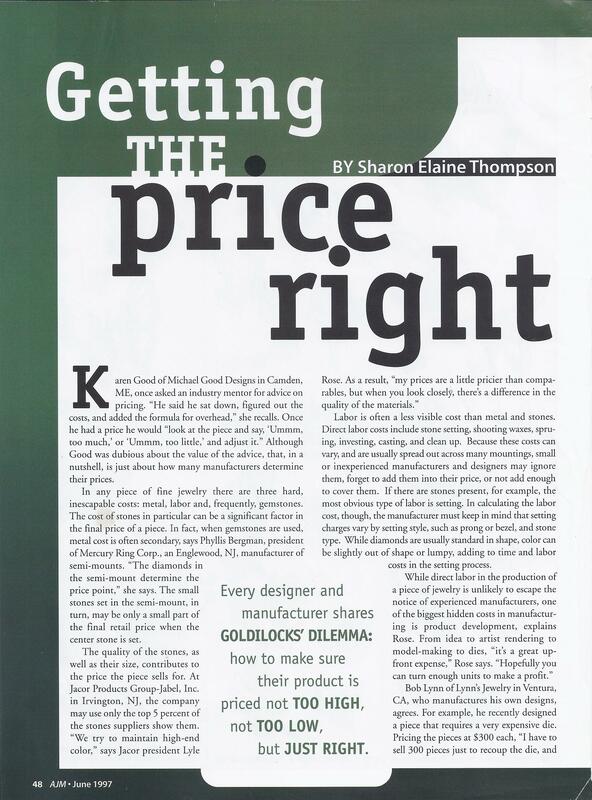 “Getting the Price Right.” Every designer and manufacturer shares Goldilocks’ dilemma: how to make sure their product is priced not too high, not too low, but just right. Click here for PDF. If you think your business is too small for the kinds of insurance that could protect you against big losses, good news. We’ve “Gotcha Covered.” Click here for PDF. 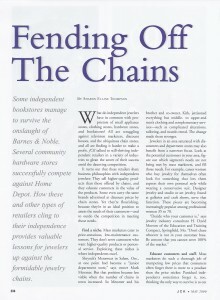 “Independent’s Day.” Independent jewelry retailers can provide a rock solid base to jewelry manufacturers who can give them service, quality, originality, loyalty and honesty. Click here for PDF. “Making a Production Out of It: Micki Lippe on the Art of Repeatables.” Making a production line is not selling out as an artist. 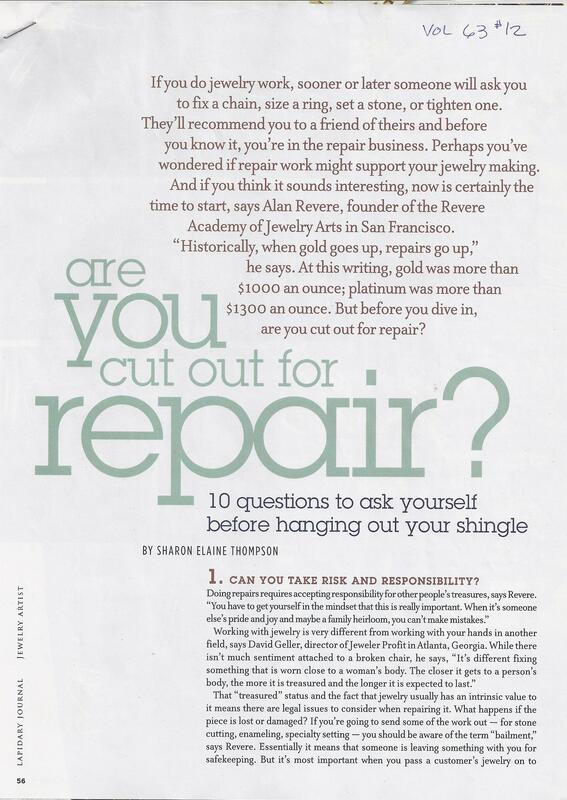 It is not only a way to get started—profitably—in making jewelry, but has many challenges and rewards of its own. Seattle jewelry artist Micki Lippe talks about her 20 years making a production line, what goes into it, and its advantages and disadvantages. Click here for PDF. 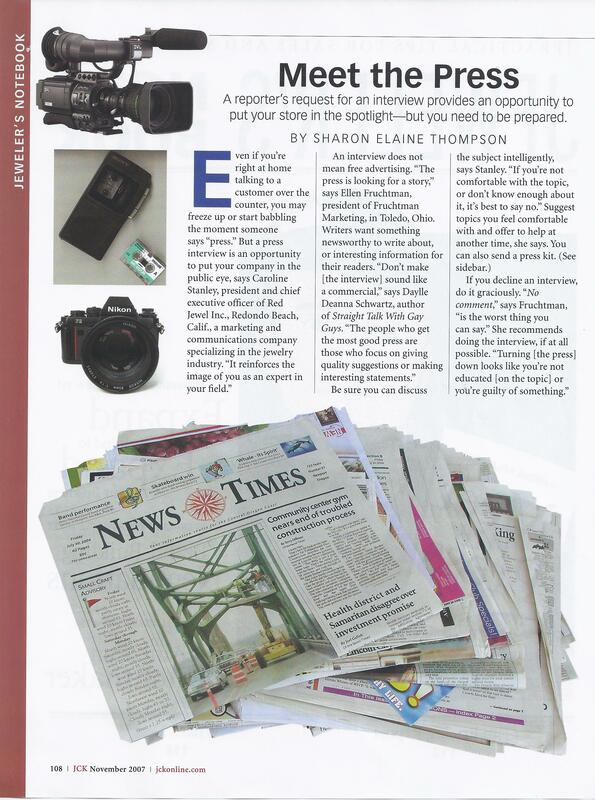 “19 Ways To Market Your Production Line.” Production work can remain lively, interesting and innovative. 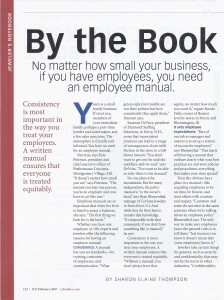 But it takes a commitment to marketing to make it work. 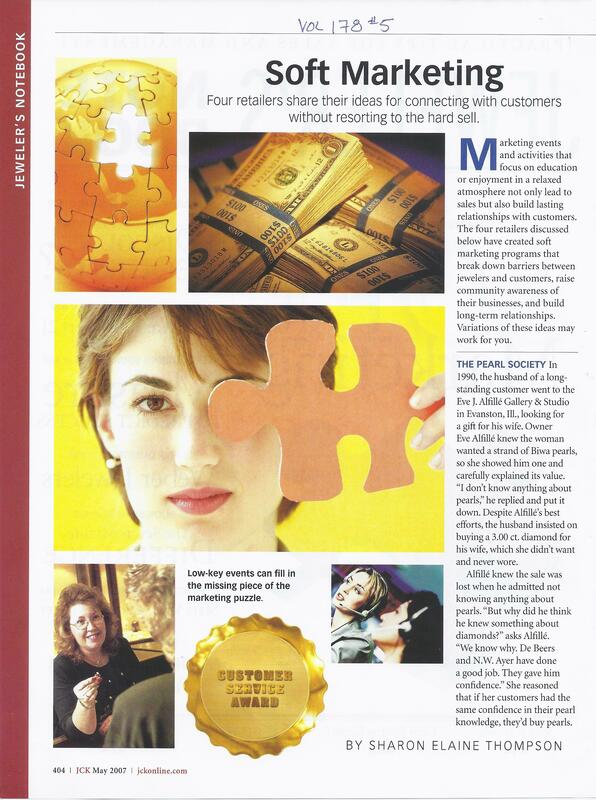 Seven artist jewelers share marketing tips that have helped them lead long and productive artistic lives. Click here for PDF. 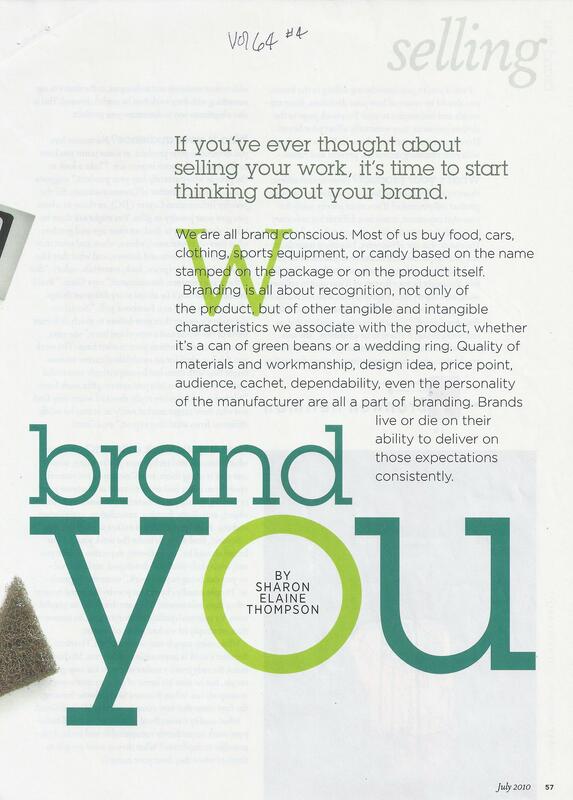 “One-Of-A-Kind Marketing.” Studio jewelry finds an enthusiastic audience among knowledgeable buyers, but it still takes marketing to reach that market. Click here for PDF. “Meet the Press.” Are you prepared to answer a reporter’s request for an interview? Here are tips from interviewers and from public relations experts. Click here for PDF. “A Fine Line: Sketching for Jewelry Artists.” While computers give designers a new tool, there are still plenty of good reasons to keep your pencil skills flexible. Click here for PDF. “Marketing Lite.” When it comes to jewelry, customers have to trust you and be comfortable with their decision to buy from you. By establishing yourself as a source of reliable information, or by breaking down the barrier between “professional” and “friend,” you build up that comfort level and trust—and in the end, make more sales. Click here for PDF. “The More Things Change.” Studio jewelry has been breaking ground for more than 20 years, yet gallery owners see only small changes in the market. Those changes may be significant for those who work with alternative materials and methods, however. 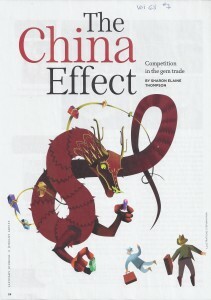 Click here for PDF.